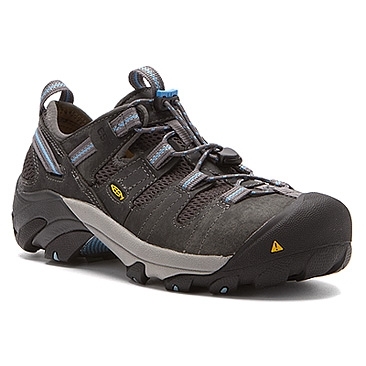 Keep your cool as the day heats up with the KEEN Atlanta Cool ESD work shoe. Featuring an upper that combines nubuck and mesh with a mesh lining, this women's work shoe pairs protective coverage with breathable comfort. It also features electro static dissipative (ESD) construction, to reduce excess static electricity, and ASTM-rated steel-toe protection, making it ideal for occupations ranging from light construction to landscaping. AEGIS Microbe Shield® helps maintain a healthy, moisture-managed foot environment. The roomy toe box, stability shank, dual-density EVA midsole and removable insole of the KEEN Atlanta Cool Electro Static Dissipative work shoe join forces to keep you supported, relaxed and energized from sunrise to sundown.